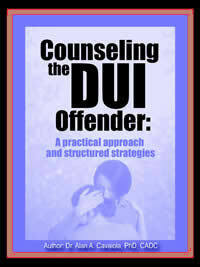 DUI Workbook by Alan Cavaiola, Ph.D.
© 2008 Alan A. Cavaiola, Ph.D.
Work with DUI Offenders More Effectively! This valuable guidebook provides current information on counseling DUI offenders in group or individual settings. It also provides you with up-to-date information on assessment strategies, how to strategically involve family members, working with resistance issues, and how to counsel DUI offenders using a structured, session-by-session protocol that you can tailor to match the length of your DUI program. This workbook goes beyond the brief, “education-only” approaches that are used with low-risk, 1st offenders and targets multiple offenders and high-risk 1st offenders who are mandated for extended counseling. Rather than “talking at them”, this workbook contains structured modules and exercises that encourage the DUI offender to open up gets them moving towards developing effective Action strategies to prevent recidivism. Other forms all contained on a CD-ROM that you can modify and adapt to your program needs!!! !